Cheering is their life and death. Ra Ra Sis Boom DEAD. My zombies are not intended to be taken seriously and are intended to be light hearted Romeronesque style figures. Sometimes I like to add even more humor to the VFM zombie collection, that is where this the pyramid came in. I wanted to experiment and see if I could make a zombie pyramid. This was what I came up with. Make the other players laugh. You can find the Zombie Cheerleader Pyramid along with other Zombie Cheerleaders in the Creatures Section of the Victory Store. 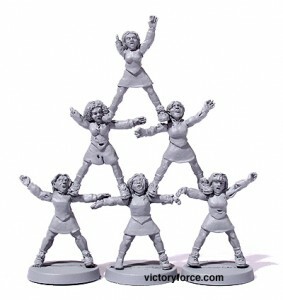 Over 1000 figures available in the Victory Store. This entry was posted in Spotlight and tagged creatures, spotlight, zombies. Bookmark the permalink.